“NUS Faculty of Science receives $1m to boost life sciences research and education,” by Pearl Lee. The Straits Times, 10 May 2013. The National University of Singapore’s (NUS) Faculty of Science received a $1 million donation which will help it boost life sciences research and education at the university. The donation came from developer SingHaiyi Group and its parent company, Haiyi Holdings. NUS said the gift will attract a matching grant from the Government, and a portion will be used to fund scholarships for some 50 graduate students at the Department of Biological Sciences over a period of two to three years, starting from this August. From 2014, the gift will also fund up to 150 undergraduates who are pursuing an honours degree in life sciences annually, for their research projects. Part of the $1 million gift will also support the Xiamen Winter Symposium, an annual life sciences conference jointly organised by the NUS Department of Biological Sciences and Xiamen University. Update – Cranston, P. S., Ang, Y. C., Heyzer, A., Lim, R. B. H., Wong, W. H., Woodford, J. M., & Meier, R. (2013). The nuisance midges (Diptera: Chironomidae) of Singapore’s Pandan and Bedok reservoirs. The Raffles Bulletin of Zoology, 61(2), 779-793. “Scientists identify pesky midges,” by Grace Chua. The Straits Times, 15 Dec 2012. THE researchers studying Bedok Reservoir’s midge nuisance have solved a pesky ecological whodunnit. They now know that two different non-biting species of the tiny insects are the ones responsible for the swarms that have plagued residents around Bedok and Pandan reservoirs for the past couple of years. But they have not yet worked out the how or why, or how to prevent future outbreaks. 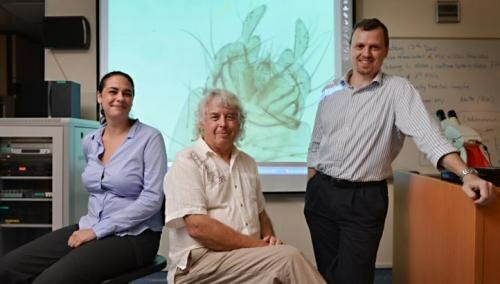 “The first thing you have to know is who’s causing the problem, then you can start addressing the issue,” said National University of Singapore biologist Rudolf Meier, who is leading a study of the midge problem. The three-year project is part-way through its first year. The culprit at Pandan is one called Polypedilum nubifer, a common nuisance species that dominates ecosystems almost everywhere it is found. But at Bedok, the culprit is a fly called Tanytarsus oscillans, a minuscule green species. It has previously been found in Sumatra, India and Japan – but is not known to cause problems anywhere else in the world, said Professor Peter Cranston, the Australia-based midge expert helping with the study. Identifying the midges is not as simple as looking at stripes or spots, researchers said. It involves staring at the insect’s rear end and mouth parts under a microscope to work out whether they really are different from other species. These midges live in the reservoir year-round, but their numbers explode only at the end and beginning of the year. Elsewhere, triggers for a midge swarm can be natural, such as water that goes from flowing to still. Or they can be man-made. For instance, nutrients flow into waterways from deforestation, construction or changing agricultural practices, Prof Cranston said. But water agency PUB said the water quality in Bedok Reservoir, which is more than 25 years old, is the same as it was before the midge swarms started last year. Seven ponds in the area collect rainwater from Bedok, Tampines and Tanah Merah, and flow into the reservoir. Another explanation is that the small fish that feed on midge larvae might have been eaten by larger non-native fish that live in the reservoir. At Pandan Reservoir, plant roots that dangle from floating wetlands provide a place for these small fish to hide, said PUB biologist Michelle Sim. Now, the research team breeds midges in the lab and collects data on environmental variables like temperature and water quality to work out possible causes. Three times a week, the PUB also counts the overall number of midge larvae (of all species) in the water; if it gets above a threshold number, it knows a swarm of adult midges is about to occur. At Bedok, general preventive measures such as fogging larvicides and scrubbing algae off rocks where midges might lay their eggs are used, and these target all midge species, said Mr Goh Chong Hoon, a deputy director of catchment and waterways at PUB. Some hopeful news for coral reefs: evidence of adaptation to thermal stress provided by James Guest et al in PLoS ONE today! James Guest, until recently, was a Lee Kuan Yew post-doctoral research fellow with the Marine Lab. All this while he has been working to understand the extent of spatial and temporal variation in thermal tolerance of corals, as this information would be crucial to the design of marine protected areas against climate change. He shares the good news that PLoS ONE has published a paper today (date in USA is 09 Mar 2012) which he submitted about adaptation by corals in mass coral bleaching sites in Singapore and Malaysia. The image from the paper below shows the different bleaching responses from their three study locations in Sumatra, Malaysia and Singapore. The photos indicate a reversed response of Acropora in Singapore and Malaysia. Contrasting coral bleaching patterns during 2010. Bleached Acropora colonies from (A) Pulau Weh, north Sumatra, Indonesia where patterns in bleaching susceptibility were normal. Reversals in bleaching susceptibility gradients in (B) Singapore and (C) Tioman Island, Malaysia, where healthy Acropora colonies were found adjacent to bleached encrusting, foliose and massive colonies: corals which are usually relatively resistant to bleaching. Background: Coral bleaching events vary in severity, however, to date, the hierarchy of susceptibility to bleaching among coral taxa has been consistent over a broad geographic range and among bleaching episodes. Here we examine the extent of spatial and temporal variation in thermal tolerance among scleractinian coral taxa and between locations during the 2010 thermally induced, large-scale bleaching event in South East Asia. Methods/Principal Findings: Surveys to estimate the bleaching and mortality indices of coral genera were carried out at three locations with contrasting thermal and bleaching histories. Despite the magnitude of thermal stress being similar among locations in 2010, there was a remarkable contrast in the patterns of bleaching susceptibility. Comparisons of bleaching susceptibility within coral taxa and among locations revealed no significant differences between locations with similar thermal histories, but significant differences between locations with contrasting thermal histories (Friedman = 34.97; p 0.001). Bleaching was much less severe at locations that bleached during 1998, that had greater historical temperature variability and lower rates of warming. Remarkably, Acropora and Pocillopora, taxa that are typically highly susceptible, although among the most susceptible in Pulau Weh (Sumatra, Indonesia) where respectively, 94% and 87% of colonies died, were among the least susceptible in Singapore, where only 5% and 12% of colonies died. Conclusions/Significance: The pattern of susceptibility among coral genera documented here is unprecedented. A parsimonious explanation for these results is that coral populations that bleached during the last major warming event in 1998 have adapted and/or acclimatised to thermal stress. These data also lend support to the hypothesis that corals in regions subject to more variable temperature regimes are more resistant to thermal stress than those in less variable environments. They will receive their awards from the Dean of Science, Prof Andrew Wee on Wed 16 Nov 2011. Jacob Phelps, our graduate student in the Applied Plant Ecology lab is there in Thailand and helping Baan Arsa Jaidee. He has setup a PayPal account to collect and deposit funds into the Thai Health Promotion Foundation account, the Thai Government agency managing the Centre’s finances. The means to donate directly into the Relief Fund will be setup, but this while take awhile and funds are needed urgently. On Thursday, Mingko sent out this appeal to donate funds via http://www.baanarsajaidee.blogspot.com. We have received updates from Jacob about the flooding situation in Bangkok. Thailand has seen the most severe flooding in 50 years. Many people have lost everything, and desperately need access to food and clean water, medicine, toilets, boats and clothes. Jacob and Hannah have been volunteering at a local centre called Ban Arsa Jai Dee to pack food for flood-affected areas north of Bangkok. It is only one of two food storage and distribution centres in Bangkok. Resources are limited and they especially needs funds to purchase: food and water for distribution, rafts and water purifiers. To learn more about their efforts and make a contribution, you can go to http://www.baanarsajaidee.blogspot.com. The link to make a direct donation through Paypal (you won’t need an account) can be found on the right side of the page. Finally, please spread the word to others! “The Thai Health Promotion Foundation, an autonomous Thai government agency, in collaboration with civil society groups – ArsaDusit Volunteers, Thaiflood, and others- has opened Baan Arsa Jaidee, an emergency relief centre on 14 Oct 2011. See “Thailand flood: ‘Making survival packs‘,” BBC News, 27 Oct 2011. 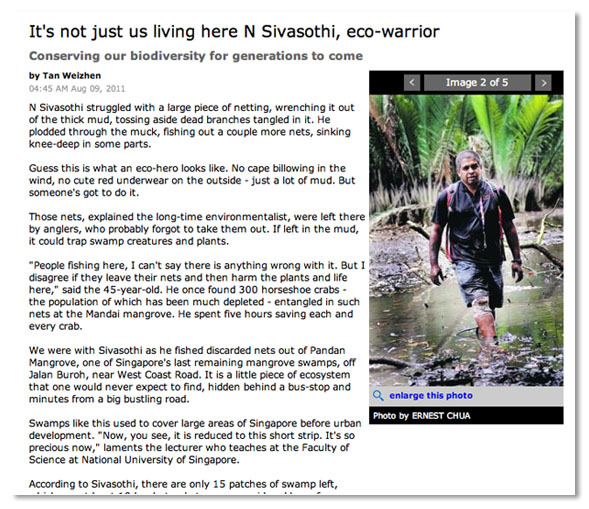 On National Day on 9 Aug, Singapore’s very own eco-warrior, Siva, was featured on Today for his tireless work in the mangroves, its conservation and clean up. Siva is a lecturer, coordinator of the International Coastal Cleanup Singapore (ICCS) and the Raffles Museum of Biodiversity Research Toddycats!, creator of this blog and supervisor of a posse of research students [yours truly included]. Click on the picture below to read the full article. Horseshoe crabs and other organisms often get trapped in abandoned gill nets. Therefore, other than having a thing about maps and first aid kits, Siva packs a pair of scissors when he heads out to the mangroves to free any unfortunate creatures he comes accross that get trapped in abandoned gill nets. Here is a video of him in action together with alumni, Theresa Su, and Toddycat, Teo Kah Ming.